Striker Mario Balotelli has refused to be a scapegoat for Italy’s World Cup exit after being deemed “not really Italian” by some fans. The 23-year-old has been the subject of racist chants during AC Milan games. Balotelli, who was adopted after being born to Ghanaian immigrant parents, responded angrily to those who have questioned his nationality. Balotelli, who is seen as a controversial figure both on and off the pitch, scored the winning goal for Italy in their 2-1 opening victory over England. But he was substituted at half-time during the 1-0 defeat by Uruguay on Tuesday. “Mario Balotelli has given everything to the national team and has not made a mistake,” he said. “Perhaps, as some of you say, I’m not really Italian. The Africans wouldn’t have blamed one of their brothers. Never. In this, we black, as you call us, we are light years ahead of you. For the best of BBC Sport’s in-depth content and analysis, go to our features and video page. Honduras coach Luis Fernando Suarez has announced he is stepping down from the role following his team’s elimination at the Fifa World Cup group stages. The Central American nation lost all three of their matches – against France, Ecuador and Switzerland – to finish bottom of Group E.
“I think a change is necessary for the benefit of the Honduran team,” said Suarez, 54, after Wednesday’s exit. The Colombian took charge of Honduras in March 2011 after leading Ecuador to a last-16 defeat against England in the 2006 finals. Honduras qualified for their second successive World Cup by finishing behind the United States and Costa Rica in Concacaf qualification, winning four and drawing three of their 10 matches. But a 3-0 defeat by Switzerland in their final group game ended their hopes of reaching the knockout stage for the first time. “I think the team will have good results in the future. But I think someone can replace me and produce different results. During his three-year reign, Suarez led Honduras to the semi-finals of two Gold Cups and coached the Olympic team that reached the quarter-finals at London 2012. 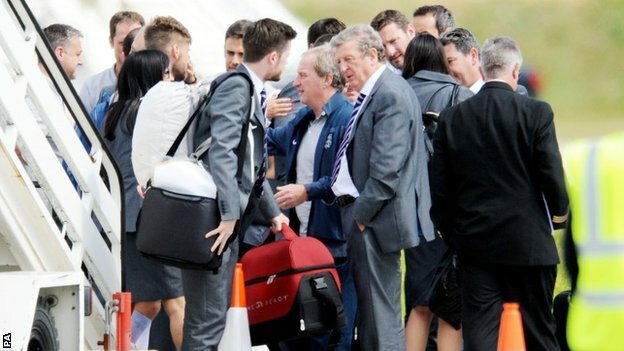 The England football team have returned to the UK after being knocked out of the World Cup at the group stage for the first time since 1958. 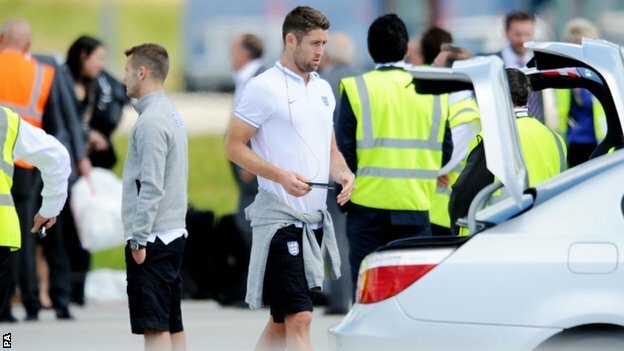 The plane arrived in Manchester from Brazil to drop off the northern-based players before landing at Luton airport with the rest of the squad. England failed to win a single game during a disappointing campaign. They ended the tournament with a dull stalemate against Costa Rica on Tuesday before leaving their base in Rio. 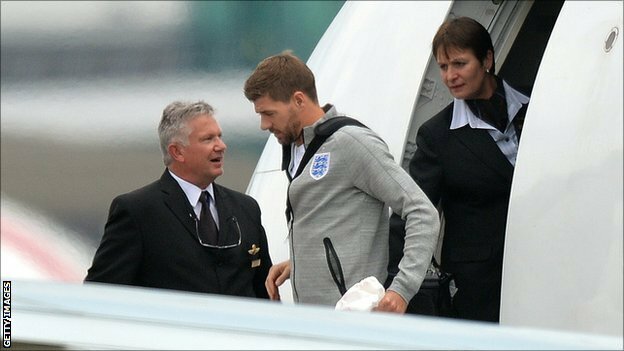 Manager Roy Hodgson has been backed by the Football Association to remain in the job but there are doubts over several senior players including captain Steven Gerrard, who is pondering his international future. Hodgson, who said he had been left “numbed” by their exit, is confident the side have a bright future with their new crop of young players. Full time Full Time Match ends, Ecuador 0, France 0. 90:00 +4:08 Full time Full Time Second Half ends, Ecuador 0, France 0. Corner, Ecuador. Conceded by Bacary Sagna. Attempt blocked. Walter Ayoví (Ecuador) left footed shot from outside the box is blocked. Assisted by Juan Carlos Paredes. Attempt blocked. Felipe Caicedo (Ecuador) right footed shot from the centre of the box is blocked. Attempt saved. Olivier Giroud (France) header from the centre of the box is saved in the centre of the goal. Assisted by Bacary Sagna with a cross. Foul by Jorge Guagua (Ecuador). Delay in match Alexander Domínguez (Ecuador) because of an injury. 88:59 Substitution Substitution Substitution, Ecuador. Felipe Caicedo replaces Christian Noboa. Attempt missed. Paul Pogba (France) right footed shot from outside the box is close, but misses to the right. Assisted by Loïc Remy. Attempt saved. Loïc Remy (France) left footed shot from the right side of the box is saved in the bottom left corner. Assisted by Karim Benzema. Attempt saved. Karim Benzema (France) right footed shot from the centre of the box is saved in the centre of the goal. Assisted by Olivier Giroud. Attempt blocked. Paul Pogba (France) right footed shot from outside the box is blocked. Assisted by Karim Benzema. 82:25 Booking Booking Frickson Erazo (Ecuador) is shown the yellow card. Olivier Giroud (France) wins a free kick on the left wing. Attempt blocked. Christian Noboa (Ecuador) right footed shot from outside the box is blocked. Attempt saved. Renato Ibarra (Ecuador) left footed shot from the right side of the box is saved in the top centre of the goal. Assisted by Juan Carlos Paredes. 81:03 Substitution Substitution Substitution, Ecuador. Gabriel Achilier replaces Michael Arroyo. Attempt missed. Michael Arroyo (Ecuador) left footed shot from the left side of the box misses to the left. Assisted by Christian Noboa following a fast break. 78:22 Substitution Substitution Substitution, France. Loïc Remy replaces Antoine Griezmann. Attempt saved. Karim Benzema (France) right footed shot from outside the box is saved in the centre of the goal. Assisted by Paul Pogba. Offside, Ecuador. Juan Carlos Paredes tries a through ball, but Enner Valencia is caught offside. Bacary Sagna (France) wins a free kick in the defensive half. Attempt missed. Paul Pogba (France) header from the left side of the six yard box is close, but misses to the right. Assisted by Moussa Sissoko with a cross following a corner. Corner, France. Conceded by Oswaldo Minda. Attempt blocked. Renato Ibarra (Ecuador) left footed shot from outside the box is blocked. Attempt missed. Morgan Schneiderlin (France) right footed shot from outside the box is too high. Attempt missed. Paul Pogba (France) right footed shot from outside the box is high and wide to the right. Assisted by Moussa Sissoko. Renato Ibarra (Ecuador) wins a free kick in the attacking half. Corner, France. Conceded by Enner Valencia. 66:37 Substitution Substitution Substitution, France. Olivier Giroud replaces Blaise Matuidi. Corner, France. Conceded by Jorge Guagua. Foul by Oswaldo Minda (Ecuador). Corner, France. Conceded by Frickson Erazo. Attempt blocked. Karim Benzema (France) right footed shot from outside the box is blocked. Assisted by Moussa Sissoko. 62:46 Substitution Substitution Substitution, Ecuador. Renato Ibarra replaces Jefferson Montero. Attempt missed. Moussa Sissoko (France) right footed shot from outside the box is high and wide to the right. Assisted by Paul Pogba. Attempt saved. Blaise Matuidi (France) left footed shot from the centre of the box is saved in the top centre of the goal. Assisted by Karim Benzema. 60:09 Substitution Substitution Substitution, France. Raphael Varane replaces Mamadou Sakho because of an injury. Walter Ayoví (Ecuador) wins a free kick in the defensive half. Attempt missed. Karim Benzema (France) right footed shot from outside the box is high and wide to the right. Assisted by Morgan Schneiderlin. Attempt blocked. Paul Pogba (France) right footed shot from the centre of the box is blocked. Assisted by Karim Benzema. Attempt blocked. Karim Benzema (France) left footed shot from a difficult angle on the left is blocked. Assisted by Lucas Digne with a cross. Hand ball by Enner Valencia (Ecuador). Attempt missed. Christian Noboa (Ecuador) right footed shot from the centre of the box is close, but misses to the right. Assisted by Enner Valencia following a fast break. 49:21 Dismissal Dismissal Antonio Valencia (Ecuador) is shown the red card. Delay in match Lucas Digne (France) because of an injury. Lucas Digne (France) wins a free kick in the defensive half. Attempt saved. Antoine Griezmann (France) left footed shot from the right side of the six yard box is saved in the top centre of the goal. Assisted by Bacary Sagna with a cross. 45:00 Second Half begins Ecuador 0, France 0. 45:00 +1:57 Half time Half Time First Half ends, Ecuador 0, France 0. Mamadou Sakho (France) wins a free kick in the defensive half. Juan Carlos Paredes (Ecuador) wins a free kick in the attacking half. Attempt blocked. Antonio Valencia (Ecuador) right footed shot from outside the box is blocked. Assisted by Christian Noboa. Attempt saved. Karim Benzema (France) right footed shot from outside the box is saved in the top right corner. Assisted by Morgan Schneiderlin. Attempt saved. Enner Valencia (Ecuador) header from the right side of the six yard box is saved in the bottom right corner. Assisted by Michael Arroyo with a cross. Corner, France. Conceded by Alexander Domínguez. Attempt saved. Paul Pogba (France) header from the centre of the box is saved in the top left corner. Assisted by Antoine Griezmann with a cross. Attempt blocked. Christian Noboa (Ecuador) right footed shot from outside the box is blocked. Assisted by Juan Carlos Paredes. Delay in match Christian Noboa (Ecuador) because of an injury. Jorge Guagua (Ecuador) wins a free kick in the defensive half. Foul by Michael Arroyo (Ecuador). Attempt missed. Enner Valencia (Ecuador) right footed shot from a difficult angle on the right misses to the right. Assisted by Oswaldo Minda. Morgan Schneiderlin (France) wins a free kick in the attacking half. Delay in match Enner Valencia (Ecuador) because of an injury. Attempt saved. Moussa Sissoko (France) left footed shot from the right side of the box is saved in the bottom right corner. Offside, France. Paul Pogba tries a through ball, but Moussa Sissoko is caught offside. Laurent Koscielny (France) wins a free kick in the defensive half. Attempt missed. Antoine Griezmann (France) left footed shot from outside the box is close, but misses to the right. Assisted by Moussa Sissoko. Moussa Sissoko (France) wins a free kick on the right wing. Foul by Walter Ayoví (Ecuador). Attempt blocked. Paul Pogba (France) right footed shot from outside the box is blocked. Assisted by Blaise Matuidi.